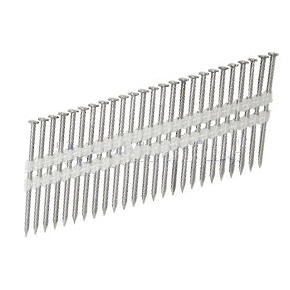 PRODUCT: 2-3/8" x .113" Nail, Steelhead #ST8D113RSS, 304 Stainless Steel, Ring Shank, 9/32" Full Round Box Head, 20-22 Degree Plastic Collated 2500/Box. Price/Box. APPLICATIONS: Decking, Framing, Joist Hangers, Etc.